Last week, Labour launched an opposition campaign in Parliament, in response to government proposals, to cut tax credits. Labour lost the vote held in the Commons on the 20th, 295 votes to 317. The government plan to limit the availability of Child Tax Credits to families who have one or two children. Last night saw a dramatic reversal in fortunes, as the Chancellor's proposals were effectively put on ice by the Upper House. Just after Labour's defeat in the Commons last week, I sat down with Dr Rupa Huq, MP for Ealing Central and Acton, to discuss the matter in detail. It's a busy Friday afternoon, at one of Labour's Ealing surgeries. Visitors sit patiently in a reception hall downstairs, waiting their turn. Upstairs, in an office, strewn with stacked red plastic chairs and party leaflets, Dr Rupa Huq MP recounts a tale. "I joined the Labour Party in...the autumn of 1990". One of the most inspiring moments of her formative years was a famous speech made in the Eighties by the then-Labour Party leader, Neil Kinnock. Dr Huq recalls a famous speech he gave with vigour, as if it was yesterday. She is clearly appreciative of Mr Kinnock's efforts as leader. "He did a lot of rebuilding of the Labour Party". It would be fair to say these fractures seem to have returned, but Dr Huq expresses a hope for healing again. "We need to be disciplined and stay together as a party". Dr Huq has was elected MP of Ealing Central and Acton, back in May, defeating Conservative opponent Angie Bray. 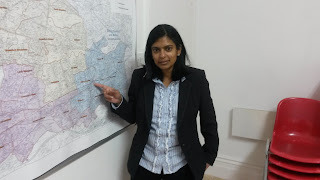 The seat is only five years old, but Dr Huq is proud to be the new constituency's first Labour representative in Parliament "It's been a steep learning curve", she tells me. "I went up by 13% on what my predecessor had". Dr Huq's success at the ballot box is tempered by the outcome of the election, across the country as a whole. If all Labour MPs had enjoyed the poll boost she received, Labour would have formed the next government. "I never dreamt that I would be an opposition MP", she remarks. However, Dr Huq has not lost hope. Far from it. It has only galvanized her resolve. "There's more that we can do as a Labour Party in opposition than I thought we could". In her speech to the Commons on the night of the vote on tax credits, Dr Huq made an impassioned speech, in which she warned that as many as 6,500 children in her constituency would suffer from the proposed cuts. Those affected won't actually be notified until just before Christmas, which led to Dr Huq described the government as "Scrooge-like". Despite her party's Commons defeat on the tax credits, Dr Huq is able to see through the government spin, and insists the government's victory was not as convincing as it seemed. "They won the vote because of the arithmetic, but it's not over yet...I'm hopeful", she adds. How right she would end up proving to be, last night. The arithmetic was inverted, into order to put the tax credit plans on ice, because the Conservatives don't make up a majority in the House of Lords. Instead, Lib Dem, Labour and Crossbench peers (and Lords Spritual) have teamed up to vote the idea down. Dr Huq is concerned, however by the fact that her party has a new Conservative majority government to contend with in the Commons, and this might just be the first skirmish of many. "There are some good people in there". Heidi Allen is one such example that Dr Huq chooses to mention, but one is left with the disappointing impression that Allen is the exception, not the rule. "At least their wings were clipped a bit by the Lib Dems, last time". Dr Huq claims that the sweeping changes of the Thatcher era inspired her to enter into politics in the first place. The Cameron era, in her view, is far worse. "I think he's had a disastrous record. We still have a deficit". To date, the UK is still running a budget deficit, even though they planned to erase it entirely and balance the books by the 2015 election. Dr Huq's next comment is particularly striking. One of the things David Cameron tried to do, to soften the Conservatives' image in the eyes of the electorate was to negate Mrs Thatcher's denial in such a thing as society. "We're all in it together" was the motto, and we were all supposed to get along splendidly, in the Big Society (or Big Soc to be frivolous). Dr Huq voices the frustration of many when she makes the following canny observation: "They stopped saying 'we're all in this together', because it's patently untrue". By the time I've returned home a few hours later, a quick search of the 2015 Tory manifesto proves Dr Huq right. The phrase is nowhere to be seen. By this point, I wish I had asked, when did they stop saying it? "This government is doing much more extreme things than Mrs Thatcher ever did...Their whole mantra is 'Long Term Economic Plan, but even they cringe when they say it". It's all just a question of how long it is, until the next recession, before this disposable motto is consigned to the dustbin of nice-sounding but actually quite empty phrasing, it would seem. "I think they've been a disaster, and they should be ashamed of themselves", Dr Huq concludes. The facts would seem to back this assertion up. We must not forget, the whole movement against the welfare cuts in the House of Lords springs from the fact that these cuts were promised in the Tory manifesto from earlier in the year. One opinion poll, published by YouGov, suggests that 46% of all voters believed the proposal was unfair, compared to just 28% who thought it was fine. What certainly seems to have happened here is that the Chancellor has gravely overestimated his abilities, and that the government's reputation is somewhat scuffed, as a result of this defeat. My interview with Dr Huq was incredibly insightful, in this regard. It was the first interview I've ever conducted properly, and it was a privilege to be able to sit down and talk with her last week. It is just the first of many that I plan to do, for this blog. Brexit - What do Londoners think?